It's a good job my livelihood isn't dependent on me predicting things correctly. Four or five days until budbreak, indeed! Today I noticed that the Cabernet Sauvignon vines are experiencing budbreak - albeit sporadic - but budbreak it is. Infact, there are quite a few adventitious buds that have developed on the vine's trunks that have already unfurled into rosy-pink, baby leaves. Go little buddies! It rained for most of today, most of the week actually. Just enough drizzly rain to make my hair annoyingly curly, but not enough to put a dint in California's water shortage woes. However, the amount of precipitation has been sufficient to make the first application (for the season) of wettable sulphur impossible. The Orange muscat vines have about 10 inches of growth already and look fantastically healthy, but they are at the stage were they should be due a second application of powdery mildew killing sulphur, not awaiting their first. Mother Nature is not cooperating. So, besides my tonsorial-tribulations, I have running through my head tortuous images of the unfettered sporulation of Uncinula necator slowly creeping over my pretty, green, succulent Orange muscat shoots. Hang in there buddies. Vinished, that's Vinoland lingo meaning I have finished tying down every last cane in the vineyard. Yay! It was a pretty easy process as the Cabernet sauvignon vines are still slumbering. The cooler weather this week has slowed things down a bit, so I'm predicting that budbreak won't happen for another 4 or 5 days yet. Also, got a couple of dead vines removed (thank you, Vinomaker) and filled the holes (that Vinomaker dug) with new, baby vines. The photograph shows, but not very well (I should have used a different background), one of the extracted vines which has a deep, 11" split along the lower half of it's trunk. Did this split cause the death of this vine? No, I'm sure this vine had just run it's natural course and the split occurred postmortem. Hate when that happens. But I love it when I have finished pruning. I am having a busy week and I am only now getting around to posting about my birthday dinner. As is our tradition, Vinomaker and I like to surprise each other with a visit to a new restaurant on the other one's birthday. My surprise eatery this birthday was Lulu's Kitchen at 1313 Main. 1313 Main is a wine bar/lounge located at 1313 Main St. in downtown Napa. Weingut Knoll, "Lobiner" 2012 Grüner Veltliner, Federspiel, Wachau, Austria. Terre Rouge, 2012 Viognier, Amador County, California. Xarmant Txakolina, 2012 Hondarabbi Zuri, Arabako Txakolina, Spain. Gamling & McDuck, 2010 Cabernet Franc, Napa, California. Lioco, "Satira" 2011 Carignan, Mendocino County, California. Muga Reserva, 2009 Tempranillo, Rioja, Spain. The tapas-style small plates we paired with these wines were all fairly decent, but really nothing to write home about. I enjoyed myself, but I'm not in a hurry to revisit Lulu's, there are so many more restaurants in the valley to try. Thank you Vinomaker for an enjoyable birthday evening. I finished pruning. Whoo hoo! My trigger finger is a bit sore, but my trusty Felco No. 6 secateurs performed admirably. Still have to tie down about 50% of the canes, but I have time as there is no real sign of budbreak in the Cabernet vines yet. Phew! Happy birthday to me, again! Yes, I'm having another one! And as much as I have enjoyed my day thus far, I don't think I need anymore birthdays after this one. Who exactly do I contact to cancel the annual anniversary of my birth? Never mind, I'm just joking. Oh...and Happy Birthday John Toshack. The first full day of spring has come and gone. But for several distractions, I spent most of the day pruning in the Cabernet vines. I think I'm on schedule to be finished the actual pruning, but not the tying down of canes, on Sunday. One distraction was a huge cluster of California poppies (Eschscholzia californica) that just looked so splendid I had to get a closer peep. The poppies got going a little later this year, because of the lack of winter rain, but they are now blooming spectacularly en masse. And they are everywhere: this year's crop is perhaps the most prolific display of full-on-poppy-goldiness I have ever seen. There should be plenty still blooming by California Poppy Day, which is April 6th. Then I got distracted by a crab spider (Misumenoides formosipes) who in turn was distracted by a small, pollen covered beetle. The beetle flew off and I went back to pruning. The 2014 Syrah pruning is in the bag. Yup, finished pruning the Syrah today, yay! And not a moment too soon, I'll say. The vines seemed to be getting more and more enthused, popping out leaves and flower clusters before my very eyes, as I worked my way along the last two rows. I couldn't resist bringing some cuttings indoors prolonging their life a little, and getting to enjoy some really fresh greenery, if only for a few days. Now, back to the Cabernet vines. A story caught my eye in the 'On Wine' section of yesterday's Napa Valley Register, or rather two specific quotes in the story did. The gist was...Leslie Rudd, owner of Press Restaurant in St. Helena (and Rudd Winery, Dean & DeLuca etc. ), had invited 25 notable, pioneering Napa vintners to be wined and dined, and join him in the opening of his new cellar - said to contain the largest all Napa wine collection in the country - at the restaurant. Guests included the likes of Paul Draper of Ridge Vineyards, Randy Dunn of Dunn Vineyards and Robin Lail of Lail Vineyards. Rare wines were poured for the guests, including; a 1974 School House, Pinot noir and a 1977 Stony Hill, Chardonnay...I bet a good time was had by all. During the dessert course a few vintners were asked to speak about wine and aging, and here are the aforementioned quotes. Firstly, John Williams of Frog's Leap Winery compared wine to people claiming "if either starts out ugly, they're doomed to remain ugly." Titter, titter. And secondly, Warren Winiarski (he of '1976 Tasting of Paris' fame) waxed a bit more lyrical than Mr. Williams philosophising that "wine is not a living thing (as many espouse), but rather a dying thing, hopefully dying gracefully." Snigger, snigger. I am going to add a third quote, more about people than wine, from my dearest mother who has been known to quip, "I don't plan on aging gracefully. I plan to do it disgracefully." The older I get, the more I am inclined to agree with her. Chuckle, chuckle. There's a lot going on in the vineyard - the least of which includes me, frantically pruning my way through the Syrah - especially in the Orange Muscat (OM) block where the vines are very enthused. And there's a lot going on in the OM's new growth; baby leaves, baby tendrils and baby flower clusters. I love how glossy the OM shoots look when they are brand new. The weather has been beautiful all week and, I swear to goodness, the OM vines grew a whole half-inch in one day. I will be finished with pruning the Syrah tomorrow (thanks to a lot of help from Vinomaker) and then I will return to the Cabernet vines. If anyone needs to find me, I'll be in amongst the Syrah. My birthday princess, V1, is celebrating her 16th birthday today. Old Brownie is not the dog she once was, but at 112 in people years she's doing relatively fine. Well, V1 now totters about like some old dear in ill-fitting high heels; her bark, of late, resembles that of a hoarse, demented sealion; and her rear caboose is a bit loose (get my drift?) in that it can't be trusted for any longer than 3 hours in the house. But all in all, she is doing great for a dog of her age - her appetite is still good, she continues to be irritated by a certain neighbour when they drive past Vinoland and, most importantly, she's been right there alongside me as I prune my way through the grapevines. She's a great dog. I spoke too soon, because I have started to panic. Why I hadn't bothered to look at the Syrah vines before today is beyond me, so when I did make the effort to go and have a peek at what the vines were up to I was horrified. I discovered that bud-swell (and lots of budbreak), is much further along than I would have liked. Drat! I had to abandon pruning in the Cabernet vines because the Syrah vines simply cannot wait. I did, with Vinomaker's help in removing last year's growth from the trellising, get quite a bit pruned. It makes it very difficult to prune when the buds are so advanced, as even the simple act of pulling the old growth away from the trellis wires can easily knock off adjacent buds - never mind the fiddly process of wrapping and tying down the new canes. I will get everything pruned eventually, even with my day-job paring into my pruning time, but I will have to accept the loss of some crop. At least the Orange Muscat and Pinot grigio pruning went smoothly this season. A little more than bud-swell, slowly but surely Vinoland's Pinot grigio vines are experiencing budbreak. As usual, I finished pruning the Pinot grigio vines, and tying down the canes with Vinomaker's help, just in time for this important stage of the vine's development. It's quite difficult to tie down canes when the buds have already started to push because there is the danger of knocking the buds off. The weather has cooled down a bit and more rain is forecast for this weekend, so I think I am on schedule to finish pruning all of Vinoland about the same time as last year (March 30th). I think I have plenty of time, at the rate I am going, to finish pruning before the Cabernet Sauvignon (CS) and Syrah vines become enthused. I am a little under half way through the CS vines (which still seem to be snoozing), but unfortunately I have to work at TWWIAGE today and won't be able to do anything in the vineyard. It's OK, I'm not panicking. I repeat, I am not panicking. After a night of heavy rain, thunder and lightning (I loved the thunder, but V2 was less than impressed), today was a beautiful day in the neighbourhood. A beautiful day for pruning, which I did a bit of in Vinoland's Cabernet Sauvignon. However, there were other folks besides me pruning in the neighbourhood. My pruning wasn't nearly as productive as the vineyard crew from Far Niente, who pruned their entire Chardonnay vineyard in one go today. And not a moment too soon: each bud, especially in the eastern block of this vineyard, was pushing - right on cue with last year. I was thinking that budbreak was a little earlier than last year, due to our warm and dry winter. But as I have said before, despite mankind's narcissism in believing that we control everything in the universe, the vines know what to do and when to do it. This morning, not being able to get out to prune as early as I would have liked to because of rain, I decided to have a second mug of coffee and a quick read of the Sunday paper. 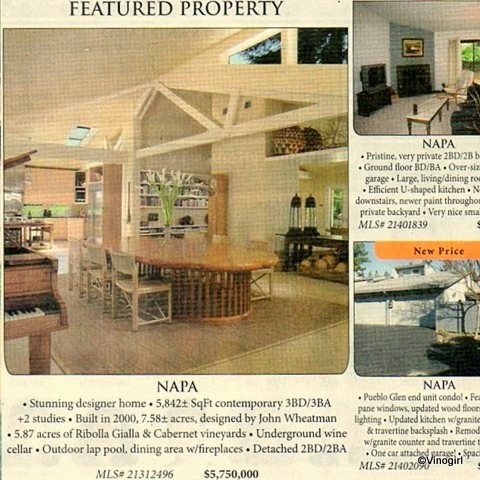 Whilst perusing the Real Estate section (I'm noticing that Napa County housing prices are definitely on the rise), I came across this week's 'Featured Property'. Now, it's not unusual that some of the higher end properties for sale come with acreage planted to vines, but, invariably, the usual grape-suspect is Cabernet Sauvignon. So I was surprised to see that this property included a planting of Ribolla Gialla, one of the indigenous grapes of Friuli in Northeast Italy. Ribolla Gialla seems an unusual choice for a Napa vineyard, in fact, I wouldn't be surprised if this was the only Ribolla Gialla planted in the entire county. I shall have to do some research. A snip at $5,750,000 (I'll take two), I can't help but wonder how much real estate could be acquired in Friuli for that amount of money. Them there's some expensive grapes. Happy St. David's Day: 2014. 'March comes in like a lion, and goes out like a lamb.' So goes the old saying, but with March being such a changeable month, weather-wise, this saying may not always ring true. And of course it all depends on ones geography: I am more likely to experience lamb-like conditions towards the end of March in Napa than my brother is likely to experience in Liverpool. March definitely came in like a lion in Napa. Extremely high winds overnight, that continued until about 11 a.m., have made a mess of Vinoland, with branches and twigs strewn all over the place. V2, who is morbidly afraid of wind, has been pinned to my side and has been loath to go outside - even for her morning ablutions. I generally don't like wind myself, it's very unsettling. One good thing, however, is that the wind has dried-up the ground a bit. It was very muddy working, tying down canes, in the Pinot grigio vines yesterday. I should have better luck today, at not getting stuck, when I start pruning the Cabernet Sauvignon vines. So Happy St. David's Day to all - whether one is of Welsh extraction, or not.